The Airbus A300-600ST (Super Transporter) or Beluga, is a version of the standard A300-600 wide-body airliner modified to carry aircraft parts and oversized cargo. It received the official name of Super Transporter early on; however, the name Beluga, a whale it resembles, gained popularity and has since been officially adopted. The Beluga XL, based on the Airbus A330 with similar modifications and dimensions, is being developed by Airbus to replace the type around 2020. Several major aircraft manufacturers are multinational, and it is not unusual for them to have plants in widely separated locations. Airbus is unique in that although it is today a standalone multinational corporation, it was originally a consortium formed by the major British, French, German, and Spanish aerospace companies. The geographic location of Airbus manufacturing is not only influenced by cost and convenience; it is also a matter of aviation history and national interest. Historically, each of the Airbus partners makes an entire aircraft section, which would then be transported to a central location for final assembly; even after the integration of Airbus into a single firm, the arrangement remained largely the same, with Airbus partners becoming subsidiaries or contractors of the multinational pan-European company. The details vary from one model to another, but the general arrangement is for the wings and landing gear to be made in the UK, the tail and doors in Spain, the fuselage in Germany, and the nose and centre-section in France, with final assembly in either Toulouse, France; Hamburg, Germany; or Seville, Spain. When Airbus started in 1970, road vehicles were initially used for the movement of components and sections; however, growth in production volume soon necessitated a switch to air transport. From 1972 onwards, a fleet of four highly modified "Super Guppies" took over. These were former Boeing Stratocruisers from the 1940s that had been converted with custom fuselages and the adoption of turbine engines to carry large volume loads for NASA's space program in the 1960s. Airbus' use of the Super Guppies led to the jest that "every Airbus is delivered on the wings of a Boeing". As time went on, the Super Guppies grew increasingly unsatisfactory for Airbus's ferrying needs: their age meant that operating expenses were high and ever-increasing, and growing Airbus production required greater capacity than could be provided by the existing fleet. Various options were studied to serve as a replacement transport medium for the Super Guppies, including methods of surface transportation by road, rail, and sea; these alternatives were discarded in favor of a principally air-based solution as they were considered to have reliability concerns and were time-consuming in operation; in addition, the assembly line in Toulouse was not conveniently accessible by any of the surface methods. A key requirement of the new air transporter was the need to accommodate every major component being manufactured by Airbus, including the then-heaviest planned part, that being the wing of the larger variants of the Airbus A340. A speedy development program was also necessitated in order to begin introducing the prospective type in time to take over duties from the Super Guppy fleet, which was scheduled to draw down in the mid-1990s. Several different types of aircraft were examined for potential use, including the Antonov An-124, Antonov An-225, Ilyushin Il-86, Boeing 747, Boeing 767, Lockheed C-5 Galaxy, and McDonnell Douglas C-17 Globemaster III; the use of any existing aircraft was eventually discounted due to a lack of internal space to accommodate the desired components, the use of a piggyback arrangement was also dismissed as impractical. Boeing made their own offer to convert several Boeing 767s for the requirement, but this was viewed as inferior to developing a purpose-built aircraft using Airbus' existing wide-body twin-engined Airbus A300-600R instead. In August 1991, Aérospatiale and DASA, two of the major Airbus partners, formed a 50/50 joint venture company, Super Airbus Transport International (SATIC), based in Toulouse, France, to develop a new-build replacement for the Super Guppy fleet. The selected starting point for the design was the Airbus A300, leading to the new airframe being designated as the A300-600ST Super Transporter. Following a pre-design period by SATIC, detailed design work was performed by Aérospatiale and DASA while subcontractors were selected to complete the 15 separate work packages; amongst these subcontractors, CASA was selected to produce the upper fuselage, Dornier provided the hydraulic systems, and Sogerma performed the final assembly work. The A300-600ST was not a like-for-like replacement, being larger, faster, and more efficient than the preceding Super Guppies. Airbus Industries elected to invest $1 billion into the program, this sum included the aircraft themselves, the cargo loading system, and program management. In September 1992, construction work begun on the first aircraft, the maiden flight of which took place in September 1994. Following a total of 335 flight hours being performed during the test program, restricted certification of the type was awarded by the European Aviation Safety Agency (EASA) in October 1995, enabling the A300-600ST "Beluga" to enter service shortly thereafter. In addition to the first aircraft, four more Belugas were constructed at a rate of roughly one per year; from start to finish, each airframe reportedly took roughly three years to complete. Modification work was performed at Toulouse using components provided by the Airbus assembly line. Originally a total of four aircraft were to be built along with an option for a fifth aircraft being available, which was later firmed up. The fleet's primary task is to carry Airbus components ready for final assembly across Europe between Toulouse, Hamburg and nine other sites, and they do so 60 times per week. The Beluga fleet is owned by Airbus Transport International (ATI), a wholly owned subsidiary of Airbus Group that was established specifically to operate the type; through this organisation, the fleet is made available for hire by third parties for charter flight. In May 1998, ATI reportedly had an annual revenue target of $15 million to be achieved via leasing spare capacity. Over time, the Beluga has been used to carry a variety of special loads, including space station components, large and delicate artwork, industrial machinery, and intact helicopters. The A300-600ST's freight compartment is 7.4 m (24 ft) in diameter and 37.7 m (124 ft) long; maximum payload is 47 tonnes. In late 1997, in response to the positive performance of the A300-600ST Super Transporter program, SATIC announced that they were in the process of evaluating several different prospective outsize freighter conversions; company chairman Udo Dräger indicated that a larger freighter based on the Airbus A340 could be developed in a similar manner to that of the A300-based Beluga. 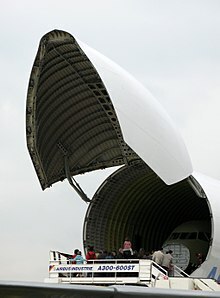 At the time, derivatives of both the Airbus A330 and the A340 were being studied, including combining the upward-swinging hinged door of the Beluga with a conventional upper deck as an alternative to a side-mounted cargo door in traditional freighter missions. During the 1990s, as a result of reported inquiries to Airbus regarding the type, a niche market for selling Beluga-type aircraft to military customers and freight operators was also examined; but sales were considered 'unlikely' to take place by the late 1990s. In November 2014, Airbus announced that it was proceeding with the development of a larger replacement based on the Airbus A330-200; five of which will start operating from 2019, replacing the last old Beluga in 2025. Airbus previously considered the A330-300 and A340-500, but each require too much of the limited 1,663 m (5,456 ft) runway 04 at Hawarden Airport near Broughton in Wales. In May 2015, Airbus confirmed that the new aircraft will have a 1 m (3 ft 3 in) wider cross-section than its predecessor and provide a 12% increase in payload. The Beluga XL is intended primarily for A350 work, and is designed with capacity to ship two A350 wings simultaneously. Five aircraft will be progressively assembled; the first two are considered essential to ramping-up production of the A350; the remaining three are to be introduced as the A300-600 Beluga fleet retires. The A300-600ST Beluga shares many design similarities, although substantially differing in appearance, to the Airbus A300 it was based upon. 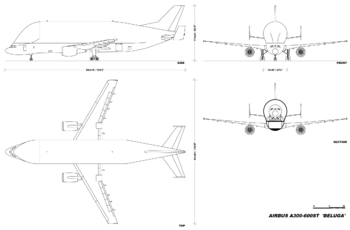 The wings, engines, landing gear, and the lower part of the fuselage remain identical to those used on the conventional A300, while the upper part of the fuselage forms an enormous horseshoe-shaped structure 7.7 m (25 ft) in diameter. In comparison with the Super Guppy, the payload was more than doubled and the volume increased by more than 30 per cent. The General Electric CF6-80C2 turbofan engines used are slightly uprated from those used on the standard A300 as well. The vertical stabilizer uses a modified Airbus A340 fin with a 1.12 m (3 ft 8 in) base extension while the tailplane was strengthened and fitted with auxiliary fins to maintain directional stability. The tailplane trim tank was also deleted. To provide access to the cargo area from the front without having to disconnect all electrical, hydraulic and flight control connections (and also avoiding the lengthy recalibrations before each flight that reconnection entailed), the standard A300 cockpit was relocated down below the cargo-floor level. By relocating the cockpit in this manner, loading times were reportedly halved from those encountered using the Super Guppy, which had needed to disconnect and reconnect such systems. Another reason for faster loading times was the adoption of a roll-on/roll-off loading system, as well as the ability to unload the aircraft in winds of up to 40 knots. 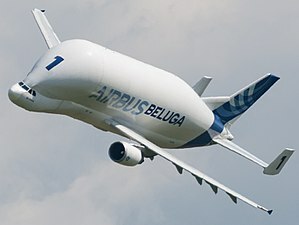 The qualities and improved capabilities of the Beluga resulted in the costs associated with transporting Airbus components dropping to only one-third of those achieved by the Super Guppy. The cockpit of the Beluga is pressurized but the cargo deck is not, making it inaccessible during flight and unsuitable for cargoes that require a pressurized environment, such as live animals. However, the cargo deck is fitted with a heating module to keep the cargo within an appropriate temperature range. On at least one occasion, a pressurized container has been used for cargo (see Operational history). The aircraft is operated by a crew of three – two pilots and a loadmaster. The main deck cargo volume of the Beluga is greater than that of the C-5 Galaxy or the Antonov An-124 but still smaller than Antonov An-225. However, it is restricted by cargo-weight capacity of 47 tonnes, compared to 122.5 tonnes for the C-5 Galaxy and 150 tonnes for the An-124. Despite this width, the Beluga cannot carry most fuselage parts of the Airbus A380, which are instead normally transported by ship and road. The Beluga has been used to transport some A380 components. In January 1996, the Beluga was formally placed into dedicated service, ferrying components from various aerospace sites to the final assembly lines in Toulouse, France and Hamburg, Germany. On 24 October 1997, the last of Airbus Industrie's Super Guppy freighters was retired and its outsize cargo mission from that point onwards being exclusively performed by the new A300-600ST fleet. In 1997, the second year of Beluga operations, the fleet accumulated in excess of 2,500 flight hours across more than 1,400 flights. By 2012, the fleet was performing roughly 5,000 flight hours per year; Airbus expected this figure to double by 2017. Since entering service, the Beluga has been subject to several infrastructure upgrades. In 2011, Pau Pyrénées Airport, a site routinely visited by Belugas, became the first airport in Europe to deploy the European Geostationary Navigation Overlay Service, which accurately guides the Beluga and other aircraft during landing. In 2015, a dedicated Beluga loading station was opened at Hawarden Airport, preventing high winds from disrupting future operations. In addition to its primary supply duties to Airbus' production facilities, Belugas have often performed charter flights for various purposes. In 1997, ATI claimed that it had to reject eight out of ten requests for commercial Beluga flights, the fleet being able to spare only 130 flight hours for such duties that year. But as more Beluga aircraft were put into service, availability increased drastically, rising to 600 flight hours in 1998 and around 1,000 flight hours in 1999; this effectively enabled one of the five Beluga aircraft to spend much of its operating hours performing charter flights. Amongst the early customers chartering Beluga flights was Boeing. In June 1997, a world record was set for the most voluminous payload to be carried by an aircraft when a Beluga was used to transport a chemical tank for a merchant vessel from Clermont-Ferrand to Le Havre, France. In February 2003, a single Beluga performed the farthest distance charter flight ever, having flown for 25 hours (not including refueling stops) to transport two complete NHI NH90 helicopters along with a single Eurocopter Tiger attack helicopter from Marseille, France to Melbourne, Australia, for the Avalon Airshow. In 1999, a Beluga carried a large painting, Liberty Leading the People by Eugène Delacroix, which had hung in the Louvre in Paris since 1874. It was flown from Paris to Tokyo via Bahrain and Kolkata in about 20 hours. The large canvas, measuring 2.99 metres (9.81 ft) high by 3.62 metres (11.88 ft) long, was too large to fit into a Boeing 747. It was transported in the vertical position inside a special pressurized container provided with isothermal protection and an anti-vibration device. In 2004, a Beluga was used to deliver relief supplies to the Indian Ocean region following widespread devastation of coastal areas by a major tsunami. In 2005, the Beluga was employed to transport humanitarian aid and medical supplies from the United Kingdom and France to the Gulf Coast of the United States, in support of disaster-relief operations in the aftermath of Hurricane Katrina. The Beluga has seen recurrent use to transport bulky objects, including vehicles, for various different space programs. In 2001, sections of the unmanned Automated Transfer Vehicle (ATV) space vehicle were transported by a Beluga from Turin, Italy to Amsterdam, Netherlands. In 2004, multiple Beluga flights were made to Baikonur Cosmodrome, Kazakhstan, to deliver Astrium-built satellites. In 2009, a Beluga was used to convey the Tranquility module of the International Space Station from Turin to Kennedy Space Center, United States. ^ "Airbus Beluga" (PDF). AERTEC Solutions. Archived from the original (PDF) on 8 July 2017. Retrieved 28 November 2018. ^ a b c d Ros, Miquel (3 October 2014). "Airbus' Beluga: The world's strangest-looking airplane turns 20". CNN. Retrieved 7 December 2015. ^ a b c d e f g h i j k l Kingsley-Jones 1998, p. 46. ^ a b c Thompson, Paul. "On the Wings of Giants: Airbus Banks on the Beluga." Airline Reporter, 6 February 2015. ^ Platoni, Kara. "Big ideas: Megalifters prove you’re never too fat to fly." Air & Space Magazine, September 2008. ^ a b c d Moxon 1994, p. 33. ^ Moxon 1994, pp. 32-33. ^ Moxon 1994, pp. 33, 35. ^ a b c d e Moxon 1994, p. 35. ^ "Type-certificate data sheet, Airbus A300-600ST." European Aviation Safety Agency, Retrieved: 1 May 2016. ^ a b c d Hanlon, Mike. "The Beluga drops in over Paris." Gizmag, 26 June 2005. ^ a b c d e f g h i j k Kingsley-Jones 1998, p. 47. ^ Gubisch, Michael (17 November 2014). "Airbus Airbus starts A330 Beluga development". Flightglobal. Reed Business Information. ^ Thisdell, Dan (18 November 2014). "Airbus logistics: from tiny fish to small whale – and now a bigger Beluga". Flightglobal. Reed Business Information. Archived from the original on 19 November 2014. ^ Eiselin, Stefan. "Das bietet der neue Beluga" aeroTelegraph, 19 November 2014. Accessed: 19 November 2014. ^ Kaminski-Morrow, David (12 February 2013). "Airbus leans towards A330-200 to replace Beluga fleet". Flightglobal. Reed Business Information. Archived from the original on 14 October 2014. ^ "A330-based Beluga to have larger cross-section". Flightglobal. 29 May 2015. ^ Moxon 1994, p. 32. ^ "Airbus delivers first A380 fuselage section from Spain". Airbus. 6 November 2003. Archived from the original on 23 January 2008. Retrieved 7 February 2016. ^ Kingsley-Jones 1998, pp. 46-47. ^ "Europe's first EGNOS airport to guide down giant Beluga aircraft." GPS Daily, 11 May 2011. ^ Hughes, Owen. "LOOK: Airbus' £30m Beluga station ensures wind does not halt play." Daily Post, 22 July 2015. ^ a b c "Airbus A300-600ST Super Transporter". AllAboutGuppys. Retrieved 21 October 2009. ^ Yarwood, Sam. "Airbus Beluga aid work remembered 10 years on from Hurricane Katrina." Daily Post, 1 September 2015. ^ Fletcher, Seth. "Whale of an Airlift." Popular Mechanics, December 2005. pp. 14-15. ^ "Another module for the International Space Station leaves Turin." European Space Agency, 24 July 2001. ^ "New connecting module for the ISS." Deutsches Zentrum für Luft- und Raumfahrt (DLR), 8 February 2010. ^ "Airbus Aircraft Family: Beluga – Dimensions & key data". Airbus. Archived from the original on 17 August 2014. ^ a b c d "Airbus A300-600ST Type Certificate Data Sheet" (PDF). Type Certificate Data Sheets. European Aviation Safety Agency. Retrieved 12 December 2015. ^ a b "Beluga A300-600ST / Freight". Airbus. Archived from the original on 2 November 2009. Retrieved 10 May 2007. ^ "Airbus A300-600ST Beluga - Aerospace Technology". Moxon, Julian. "A Question of Scale." Flight International, 31 May 1994. pp. 32–38. Kingsley-Jones, Max. "More Room on Top." Flight International, 5 May 1998. pp. 46–47.